This report makes complete sense. I'm sorry the New York Times buried it in today's edition. Should be on the front page. Of course, global warming is itself a political boondoggle that only dupes believe in. So there is little point in pointing out that ethanol subsidies won't help it. Nothing will, except more media attention to the brave scientists who are risking their careers to show that the politically-correct juggernaut is based on faith and not science. Iowa farmers cause rain forest deforestation. Man, talk about having to believe five impossible things before breakfast. BTW, the cane ethanol that supplies FORTY PERCENT of Brazil's transportation fuels is grown ONE THOUSAND MILES SOUTH of the Rain Forest. I think that if I were going to write an article about computers I would start with today's models, and those under development, Not the 1980's Zenith. Why do all rabid biofuels bashers insist on looking backwards? Oh, never mind. Anyway, here's an excellent "rebuttal" post that looks at what's really HAPPENING, TODAY, and is getting ready to happen TOMORROW. Agree with Rufus. The NYT article could have been written ten years ago and it might have done some good. In 2008 it is bound to be misinterpreted by many as saying that the pursuit of bio fuels is a huge boondoggle. Biofuels like algal biodiesel, cellulosic alcohols, biomass combined heat/power, and pyrolitic conversion of biomass, are all going to be beneficial. But that is all new technology, which was ignored by the NYT. But Rufus, how many decades will it be before hundreds of thousands of desperately poor Juan Valdez's stop slashing and burning the Amazon, and adopt the "new" way? And why would the big shots down there invest in the new way, when the old way maximizes profits (and tax revenues for the gov't) for the foreseeable future? Today's needs rule the lives of most people, culture has enertia, and politics makes deals with the Devil. In the meantime, the forest is gone. Iowa farmers plant corn to harvest the subsidies for ethanol. This cause a reduction of land available for soybean production in the US and an increase in soybean prices. So rainforests and prairies in Brazil are destroyed to plant soybean to replace what the US corn farmer used to raise. Rufus, I believe if ethanol production was found to kill people you would still continue to cheerlead it. he NYT article could have been written ten years ago and it might have done some good. In 2008 it is bound to be misinterpreted by many as saying that the pursuit of bio fuels is a huge boondoggle. The pursuit of biofuels may not be a boondoggle but the current system certainly is. These technologies may be useful in the future but they are not commercially or technically feasible right now. An unfortunate part of the existing ethanol boondoggle is that it will make the commercialization of those technologies more difficult if not impossible. In one paragraph, you manage to protect yourself from charges of rushing to a conclusion ( I know that correlation is not equal to causation), but donâ€™t hesitate to predict that â€œcareful academic work will pin the blame for the destruction on ethanolâ€. Why then are you consistently critical of the proponents of climate change theory who say the same thing, â€œI know that correlation is not equal to causation, but the fact is that this climate change really accelerated after the Co2 emissions from power plants increased. My prediction is that careful academic work in the coming years will pin the blame for the climate change on CO2â€? 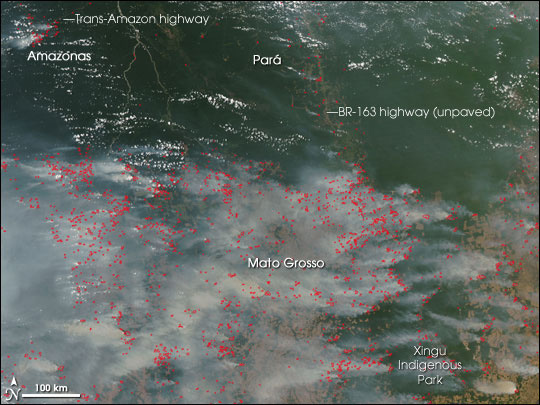 Maybe Brazil should just enforce their "no burning down of the rainforest" laws, eh?